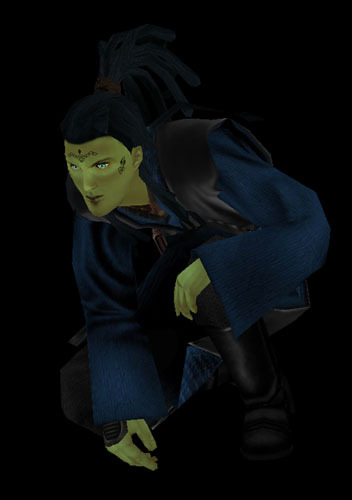 Roahu was born to a modest family on Mirial and shortly thereafter was taken to Arkania to begin his training in the Jedi Order at the Arkanian Praxeum. Roahu’s only memories of his home planet are the massive cold-sand deserts and frozen lakes that the Mirialans use as a source of fresh water. As a youngling at the enclave Roahu was often found wandering the icy cliffs of Arkania when he had completed the basic activities each day. Through long terms of exposure he developed a natural affinity for tapas in cold environments. It is also believed that Roahu developed his perspective of the Force in nature through his solitary adventures before apprenticeship. Not long after completing his training as an initiate Roahu was apprenticed to fellow Mirialan Kolar Tilaya. Roahu had a strong connection to the Force but he had difficulty controlling his abilities due to the lack of guidance in development of his connection to nature. It was for this reason that Master Tilaya chose to train the young Mirialan – to guide him along the correct path to the Force and harmony with nature. One of Roahu’s long-standing assignments came on the planet of Hapes. There was strong political conflict on Hapes that required the regular protection of diplomats to ensure peace between disgruntled factions. Roahu was chosen by the reigning Hapan leaders due to his exceptional physical stature and handsome appearance. It was the first time in his life that Roahu was able to spend vast amounts of time in an unfrozen climate consisting of crystalline seas, dense forests, and pasture mountains. The days spent on Hapes instilled an even greater respect for the beauty of nature in Roahu as the culture’s strong affinity for pulchritude was absorbed in his developing character. All the appreciation of nature did not come without a cost to the growing apprentice. His long periods of weathering the never-night natural light on Hapes left him with a minor form of the local phenomena: partial night-blindness. Later during the war with the Chiss Ascendancy Roahu was stationed on New Holstice as an apprentice healer to assist with the recovery of those injured or ill due to the galactic conflict. Roahu was not the avid physical healer his contemporaries had hoped him to be. Rather his focus was on the spiritual and emotional well-being of those he was assigned to heal. Attempting to keep all life connected to the Force and allowing each individuals’ nature to heal them from the inside out eventually became the cornerstone of Roahu’s promotion to Knight. Years later while still officially stationed out of Arkania word came from the Enclave on Alzoc III that there was an opening for a Knight to help instruct the increasing student population. Roahu jumped at the chance to expand his horizons in the frozen tundra of Alzoc III and embarked on the next step of his destiny.